These are not the B&Bs we remember…. Back in the UK, when dinosaurs roamed the earth, there was an institution known as the ‘Seaside Bed and Breakfast’, a type of hotel for the masses to stay in during their two week vacation at the beach. 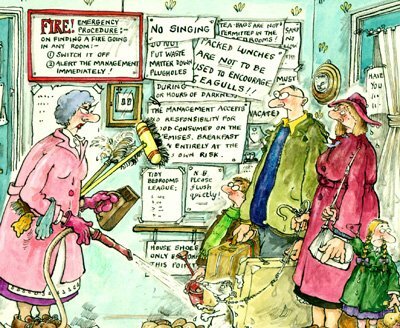 They were usually presided over by a formidable landlady who ensured that all her rules were adhered to, that breakfast was taken at the hour of her choosing (when she rang a gong!) and that guests were out of the establishment by 9:30am and not allowed back until 5pm regardless that a hurricane force gale was blowing on the beach. Such fun! Bed and Breakfast accommodation here in the USA these days is nothing like that hackneyed cliché. 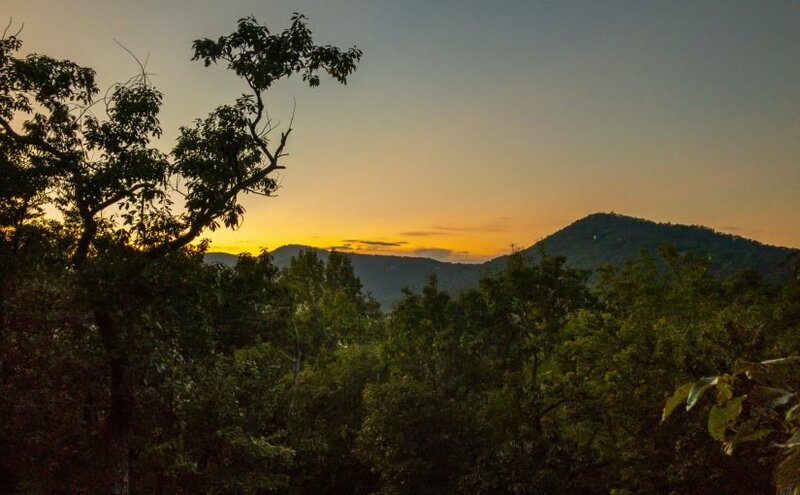 We’ve (thank you Researcher in Chief Bethany) sought out any number of B&Bs over the past while as an alternative to conventional hotels, and more precisely as an alternative to staying in anonymous chain, box, hotels when only one night is required. Most recently we’ve stayed in Watkinsville GA, Auburn AL, Louisville KY and Tallahassee FL, each of which have been spectacular. There is much media chatter about what AirBnb are doing to the hotel business, but to my mind the real story is how Bed and Breakfast is bringing a new meaning to true hospitality. 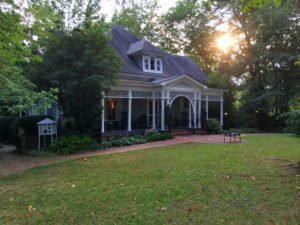 Let’s look at our stay in Watkinsville…..
We chose the Ashford Manor (http://ambedandbreakfast.com), which is right in the centre of Watkinsville, 10 minutes from Athens GA. Watkinsville itself is a pretty town, with a bunch of good restaurants and stores right outside the B&B. The rooms are a delight – eclectically designed and very comfortable – just look at the photos. 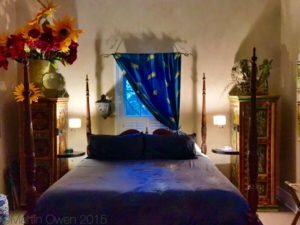 We stayed in the Cottage Gallery Suite – again see the photos – and it was absolutely charming. 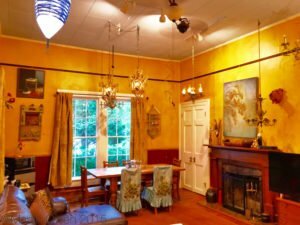 They also have a suite that is dog friendly (The Cottage Hideaway Suite) and a room in the main house that accommodates dogs. The B&B is owned and run by Dave and Mario who are a case study in Hospitality Management. Check-in was easy (as was check-out!) and the breakfast was perfect. We stayed in mid-June and the weather was ideal to have Sunday breakfast on the front porch. An added draw is that Ashford Manor also specializes in weddings, so if you’re about to tie the knot, it’s a place to look at. 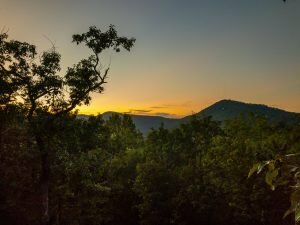 Back in April, we traveled up to Asheville NC (see the blog ‘Thinking outside the Kennel’) and on the way back broke our journey in Auburn – Researcher in Chief Bethany, is a graduate (War Eagle! apparently). Rather than stay in an anonymous chain hotel, we chose The Crenshaw Guest House (http://crenshawguesthouse.com). No photos unfortunately but have a look at their website. We stayed in Thach Cottage, which again is dog friendly should you be traveling en-famille (or even ‘Avec Chien’!). As you’ll see from their photos, again the rooms are really comfortable and welcoming. But the common theme with these B&Bs is the welcome you get from the owners, in this case Steve and Sarah Jenkins, and the amazing breakfast they provide. 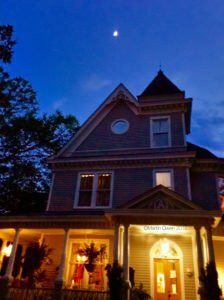 Whenever I have to travel to the Florida State Capital, Tallahassee, I always check into The Little English Guesthouse (http://www.littleenglishguesthouse.com) run by fellow Briton Tracey Cochran and her husband Thom. It’s very English themed and the welcome is perfect. Hospitable but not intrusive. The food is exactly what’s needed before a day treading the halls of government and the afternoon glass of Sherry doesn’t go amiss either. Speaking of amazing breakfasts, you can’t beat the DuPont Mansion in Louisville KY. We stayed there for nearly a week in March. http://www.dupontmansion.com to check out the photos. The property itself is both beautiful, historic and very convenient. The welcome from the InnKeepers as they term themselves was exactly as you’d be taught in the best hotel schools. ….and the breakfasts….. Simply amazing. One more for your list. The Shade Tree Inn in St Francisville LA. ( http://shadetreeinn.com ). We stayed there back in 2012 and it’s as different from the others I’ve mentioned as it could be. This is a 4 acre hilltop bird sanctuary hidden away in the Deep South. I’ve added a photo of the panorama from our room. An unbelievable welcome, perfect hospitality and great food. 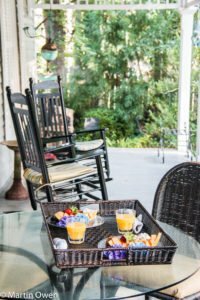 The thing that comes from all these outstanding Bed and Breakfast establishments is that they are not providing a commodity – a room to stay in and that’s it. They are providing a true experience, a reason to go there in addition to visiting the destination for vacation or business. My visits to Tallahassee for example could be achieved in a day – early morning drive down I-10, business meetings and a drive back. But the experience of staying in the Little English Guesthouse encourages me to go the afternoon before. I’m rested and calm before I start my day of meetings and I’ve had an experience, not just a night in an hotel.The same applies to all the B&Bs I’ve mentioned, and others we’ve stayed at. Breakfast on the front porch, Ashford Manor. The bedroom in the Cottage Suite Ashford Manor. and by the stories they tell their friends and family. If you’re involved in tourism, hospitality, restaurants or attractions, that must be your number one goal – surely?